I believe that unarmed truth and unconditional love will have the final word in reality. This is why right, temporarily defeated, is stronger than evil triumphant. MLK, Jr. Despite the devastating events of the past months, we remained committed to the ministry we had been called to build. We tried to move forward, welcoming our new associate pastor and continuing with our work. 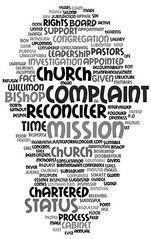 For a short time there was a flurry of meetings of the staff-parish relations committee and finance committee. 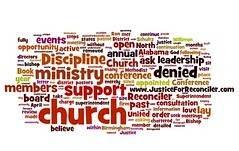 There were flurries of emails from our new associate pastor, many of which started, “this is being sent to you as a member of the board,” or “this is being sent to you as a member of the staff-parish committee.” It appeared that the church would be allowed to move forward with its ministry and with its elected lay leadership. Ron Schultz had questioned our long-standing and open practice of having associate and affiliate members at Reconciler. These were people who maintained their primary membership at other churches but wanted to be connected to Reconciler in an official capacity. They were active in the ministry at Reconciler and their other church, serving as a liaison and helping encourage a broad support and participation in our community. This effort was a part of building our church from the first. Our brochures acknowledged the opportunity to become an associate or affiliate member, and we often talked potential members out of becoming full members at Reconciler with the express purpose of having them maintain ties with churches around the city. In 18 years of openly recruiting associate and affiliate members and reporting them on our charge conference reports as a way of building our base, nobody at the conference level had ever questioned this practice until now. Suddenly, we could no longer have affiliate and associate members from the Birmingham area. And they could no longer serve in leadership roles. The staff-parish committee was purged of all formerly associate and affiliate members, now termed by the DS as non-members, but the rest of us continued to meet as a committee and receive email as the SPRC, so it certainly appeared to us that the church would continue to function with all the rights and responsibilities of any other chartered congregation. Justice for Reconciler: Who are we?